Natural Instances of Self-Similarity These Holes Might Go Right to Hell Beautiful Fractals in Nature Cool Circles Formed by Nature Natural Bridges Built by the Earth Most Beautiful Natural Wonders The Most Insane Types of Weather Places That Sank into the Sea Fascinating Things in Desert Lands Land Bridges That Changed the World All About the Vile Vortices Cenotes: Creepy or Magnificent? How to See a Fire Rainbow Strange Ice Circles of the Sea Take a Good Look Inside a Glacier The Otherworldly Aurora Borealis Incredible but Rare Phenomena Are These the Gateways to Hell? As it turns out, you don't need a spaceship to get to another realm. Some of the most baffling mysteries of the universe are right here on Earth. In the Bahamas, amidst a myriad of tourist attractions and natural wonders, you find a number of blue holes. But what are the blue holes of the Bahamas? 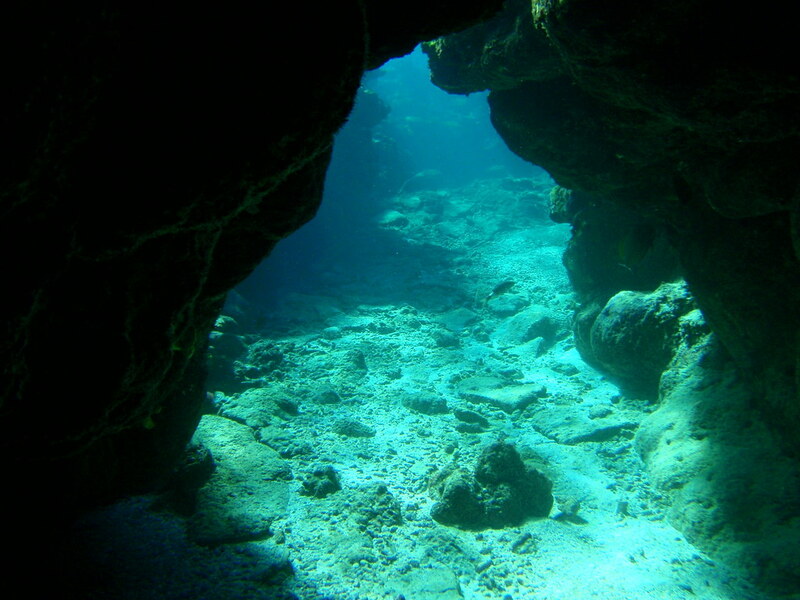 Think of them as vertical caves, burrowing down into the depths of the ocean rather than into the rock on dry land. These unique aquatic spots are surrounded by mystery, but few dare to dive into their depths. These sunken caves stand alone amongst the world's ecosystems. Their stagnant water and low levels of oxygen make them inhospitable to much marine life, but bacteria thrive in their environment. But maybe a monster lives between those slimy walls - some divers claim to have had a run-in with a giant tentacled creature here. It's not surprising that stories have sprung up about these formations. After all, the Bahamas are home to one of the world's deepest blue holes: Dean's Blue Hole, which stretches down approximately 663 feet under the water. Who knows what could be lurking in those dark and chilly fathoms? This list lets you learn intriguing facts about the blue holes of the Bahamas -without getting your feet wet. Read on to discover more about these tranquil, yet eerie destinations. Blue holes contain the bones of bygone monsters - who's to say they don't hold a living one, too? According to local Bahaman lore, the blue holes are the home of a sea creature called the lusca. While it's never been captured on camera, the lusca is described as a gigantic cross between an octopus and a shark. One man described being "violently yanked underwater" near a blue hole. He reportedly escaped and swam to shore, but found "huge sucker marks on his thigh." 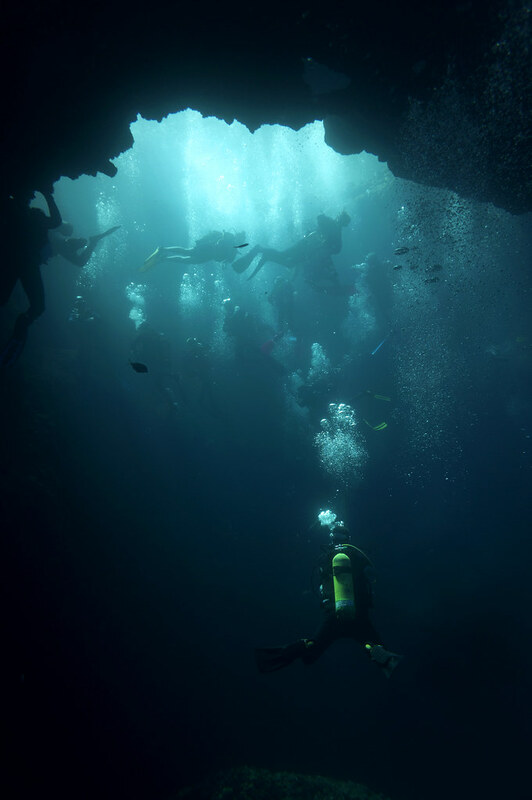 Human remains have been found in blue holes throughout the Bahamas. One set of bones dates back approximately 1,050 years. The skeletons are believed to belong Lucayans, the original inhabitants of the islands. Researchers think the Lucayans may have considered the blue holes sacred, and treated them as holy burial grounds. "They [the Lucayans] revered blue holes and caves as spiritual portals to the world beyond life," says Nancy Albury, a museum curator and blue hole researcher. The saltwater in inland blue holes is unique. It contains little to no oxygen, and swirls with poisonous hydrogen sulfide. Riding over the top of this soup is a cap of fresh water. It's an environment that seems hostile to most life, but the water is actually home to bacteria that aren't found anywhere else. These organisms thrive without oxygen, and survive thanks to the caves' one-of-a-kind chemical reactions. Blue holes are home to some larger creatures as well, though they're still pretty unusual. The Agostocaris cave shrimp, for example, is almost entirely see-through and completely blind. It's hard to imagine the sunny Bahamas during the Ice Age, but if you need proof of that cataclysmic era, look no further than the blue holes. They were likely formed around 300,000 years ago, when growing ice caps caused sea levels to dramatically fall. That exposed soluble rock, which was gradually eaten away by acidic water. A network of caves was formed, and as the rock was weakened and collapsed, sinkholes appeared. Just add water to create the blue holes seen in modern oceans.